Have your thermostat properly installed - Here's what you need to know about proper and safe installation of your programmable thermostat, as well as when you should call a certified HVAC contractor to handle the installation for you. Properly set and use your thermostat - Follow these guidelines to achieve savings. Save with your manual thermostat - If you choose to keep your manual thermostat, here are recommendations to help you save, too. EPA suspended the ENERGY STAR programmable thermostats specification effective December 31, 2009. 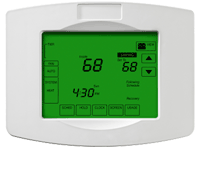 What else should I look for when buying a programmable thermostat? Choose the right programmable thermostat - There are three types of programmable thermostats designed to best fit your daily schedule. Learn more about the energy saving features that each model offers. The average household spends more than $2,000 a year on energy bills - nearly half of which goes to heating and cooling. Homeowners can save about $180 a year by properly setting their programmable thermostats and maintaining those settings.